1. Place the gelatine leaves in a bowl of cold water and leave to soak. 2. Place the prepared lychees in a blender and whizz until as smooth as possible – you should end up with about 150ml lychee purée. Spoon the purée into a medium-sized saucepan along with the sugar and cream. Mix and heat gently until the sugar has dissolved. Remove from the heat. 3. Squeeze out the water from the gelatine and stir into the cream mixture, stirring well until dissolved. Pour the cream through a sieve into a jug, pressing everything through with the back of a spoon. Divide the mixture between 4 serving glasses, cool completely then place in the fridge to set – about 1½ hours. 4. Meanwhile, for the jelly, reserve about 4 tablespoons of the seeds to decorate. Pulse the remainder in a food processor until roughly chopped. Pour the chopped fruit and juice through a sieve into a small saucepan, pressing as much juice as possible through the sieve without crushing the white pips too much as they can be quite bitter. You should end up with about 200ml juice. 5. Place the gelatine leaves in a bowl of cold water and leave to soak. Add the sugar to the pomegranate juice, bring to the boil then remove from the heat. Squeeze out the water from the gelatine and add to the juice, mixing well until dissolved. Set aside to cool. 6. 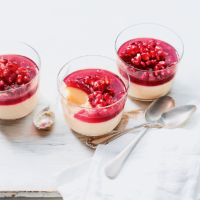 Pour the cool pomegranate juice over the set lychee cream and add a tablespoon of reserved pomegranate seeds to each. Carefully return the glasses to the fridge and chill for at least 2 hours until the jelly has set. This recipe was first published in March 2016.